METAPHORICAL MANDALA ::: This painting is my second metaphorical mandala work. The mandala not only functions as a decorative or artistic framework, but also works to insinuate a journey or progression—seeing it as a wheel, which turns to create motion or movement makes this association easy to understand. The progression or movement is also created when considering how colors are arranged. For those who have studied the chakras, the progression of color and how it weaves through the piece will immediately communicate the pathway or journey through the chakras—journeying from the red root chakra to the purple white of the crown chakra and back down again, forever up and down according to the movement of the kundalini. 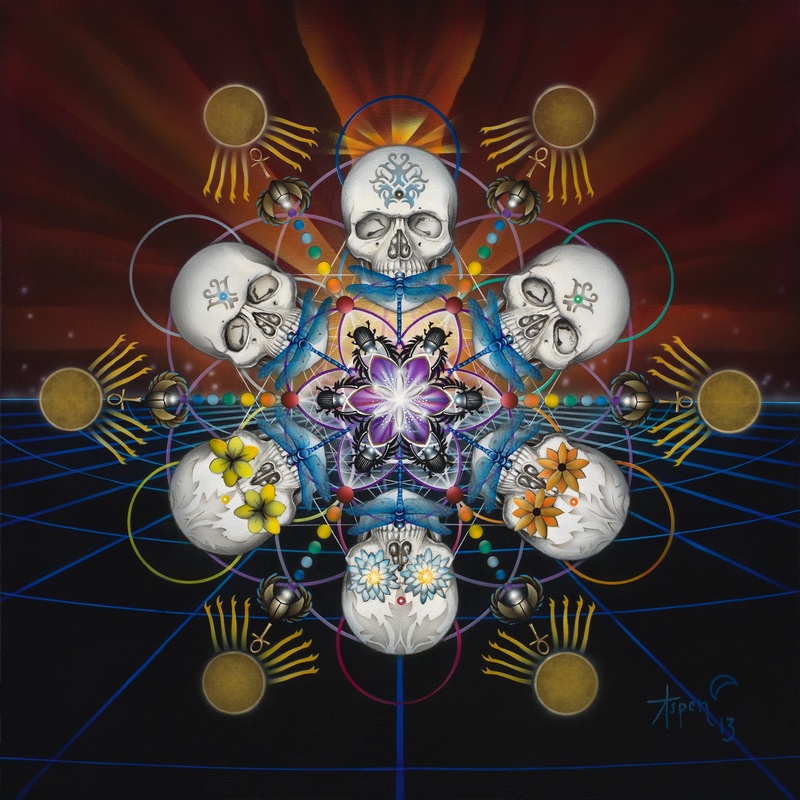 The journey in the metaphor of Metatron’s Journey begins with the skull at the top of the mandala—this location in “the wheel” represents the default notion of consciousness, in other words, our waking, aware state of being, where we live most of our reality. This is the realm in which we work, play, associate with others, and live within our understanding of being clinically conscious. This skull is placed in the third eye (6th chakra) position of the mandala—where we must begin our sojourn into the realms of deeper seeing. There are many direct and indirect pathways a wanderer could take from the starting point, each stringing a uniquely interrelated thread of ideas, dimensions, and moments to derive meaning. Direction may also affect the experience…going forward vs. backward, clockwise vs. counter-clockwise, etc. I’ve included references to the ankh, a well-known symbol for “life.” Life is our constant and what we all have in common. It is also the greatest gift we’ve ever been given. Whilst some believe the ankh may have originated as the belt clasp of Isis, many of the Egyptian gods carried the symbol. In my work, The ankh pours from an opening scarab flying out from the Golden Sun Disk, which is the symbol of the monotheistic god Aten in Egyptian mythology. “During the Amarna period, the ankh sign was depicted being offered to Akhenaten (Ankh + Aten) and Nefertiti by the hands at the end of the rays descending from the sun disk, Aten. Therefore, the ankh sign is not only a symbol of worldly life, but of life in the netherworld…we also find the dead being referred to as ankhu, and a term for a sarcophagus was neb-ankh, meaning possessor of life.” (Source: TourEgypt.net) In my work, it helps articulate the space between episodes of death and rebirth in various aspects— forsaking learning for wisdom, the loss and return one’s of innocence, chapters or phases of life, one’s notions of truth, or even literal incarnations. The Dragonfly is a powerful symbol and in this work represents not only the true power of consciousness to dissolve illusions and see truth, but also the vibration of sound and the throat chakra. “Many believe that dragonflies can travel between dimensions and are messengers of dreams and illusions.” (Source: Dragonfly Symbolism and Facts) These are the very same realms to which our dream consciousness and imagination journey and dwell, and therefore I’ve used dragonflies to convey the idea of our consciousness being carried to the mystical, contemplative, reconciliatory, and more deeply conscious pinnacles of our consciousness. The upper and lower halves of the painting insinuate two very distinct realms of consciousness (as you wish: waking vs dreaming; conscious vs. subconscious, etc., etc.). But they work together to create a bridge-point of transcendent centeredness which emanates in harmony and with balance. The top half represents the outer realms of consciousness, with eyes open and perspectives vast. The lower represents the inner world of one’s consciousness, where vision is not constrained by our eyes, nor journeys tethered by our bodies or space or time, and with a context that is less derived or predetermined. And the two states of being cooperate—one realm of consciousness relies on the other to give it context, meaning, contrast, and value. Touching back to the dragonfly analogy, developing one’s ability to see in all directions, including all states of consciousness, seems to be a gateway to higher understanding and higher self-awareness. Seems like the ability to see all pathways within the structure would be the ultimate perspective. This would enable the transformation of experience and observation into deep wisdown. 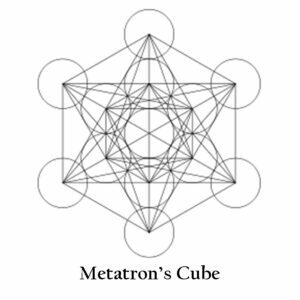 Which I suppose is the journey we are all taking…right along with Metatron.